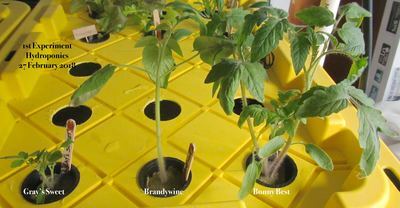 I have been interested in hydroponic gardening for a few years and have successfully grown things hydroponically, including vegetables, including tomatoes, flowers, including roses and herbs. I have often wondered what the difference would be between plants grown in soil compared to plants grown hydroponically. So I started a bit of an experiment today. I have grown both the Red Brandywine, but did not know there were two different strains, and the Black Cherry before with good results - except for last year which I blame on the weather. I purchased the seeds from Heritage Harvest Seed Company based in Carman, Manitoba. I had used another heritage seed company before but have not been 100% satisfied with the results for the past two years. Mind you last year the poor results could be mostly blamed on the weather but even the spouting was not that good, in some instances less that 50%. 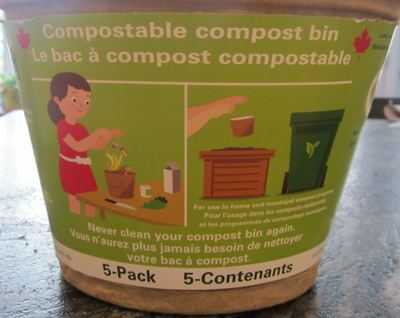 I had heard about this company when I was chatting with one of the farmers at Upper Canada Village and decided to give them a try. “At Heritage Harvest Seed, all of our seed is open pollinated, non-hybrid, non GMO, untreated, natural seed. Their seeds may be a little more expensive but I am interested in the nonGMO, non-hybrid type of seeds. The main reason (and I keep saying that I am going to do this) is that any seeds you save will be ‘true to form’ meaning that you will get back the exact same plant that you started with. This can not always be said about other commercial seeds. To observe the difference between tomatoes grown in soil as compared to tomatoes grown hydroponically. The Brandywine tomato is legendary for its delicious taste and the Sudduth’s Strain is considered by many to be the most delicious strain available. This particular strain was obtained in 1980 from Dorris Sudduth Hill. Dorris claimed that it had been in her family for 80 years. The large deep pink beefsteak fruit can grow 1-2 pounds and are quite late maturing. (Start indoors early.) It is simply an exceptional tomato that no gardener should be without! This strain is rather hard to find although Brandywine is quite common. Indeterminate, potato leaf foliage. A must have! (90 days from transplant) RARE. One of the highlights of the season! Introduced in 1908 and still one of the best all purpose tomatoes available! The healthy plants produce loads of medium to large size beautiful red blemish free fruit with great taste. Excellent for canning and slicing. Highly recommended! Indeterminate, regular leaf foliage. Our favorite red cherry variety! The enormous plants are literally covered with clusters of small red cherries all summer long! One of the best tasting varieties there is. This would be a good variety for growing on fences or other large structures. Indeterminate. 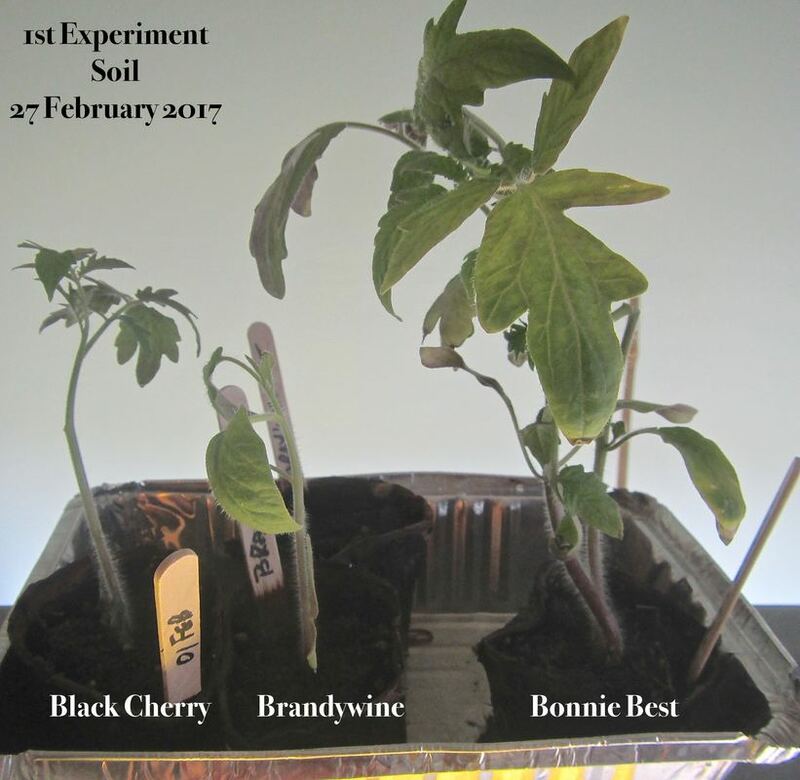 ​ Tomato seeds planted in soil. seed in soil sprouted after 8 days. seed in soil sprouted after 11 days. Because one type in each medium has not sprouted the questions are: reason for not sprouting, bad seed or to much water and should I try another seed in each medium? ​27 Feb 2018 - Moved hydroponic based plants from original grow tray to the full time hydroponic tote. 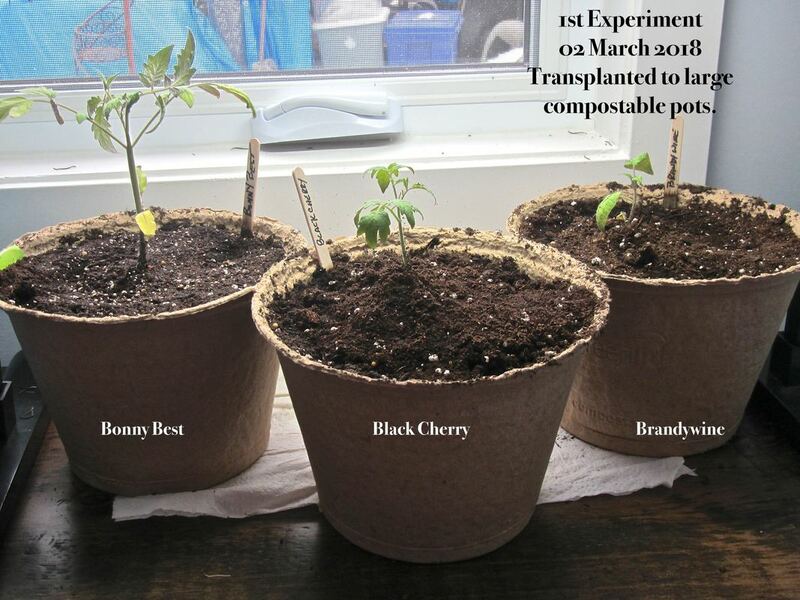 03 March 2018 - Transplanted Bonny Best, Black Cherry and Brandywine to large compostable pots and placed under grow light in the dining room window. 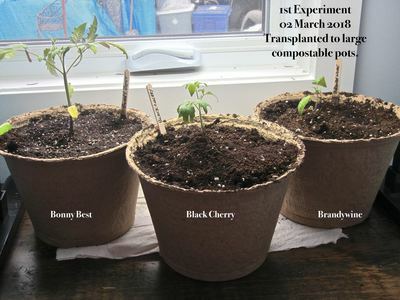 On transplanting put a banana peel and 1 tablespoon of Epsom Salts in the pot just below where the plants would grow, covered that with a bit of soil and planted the seedling on top. 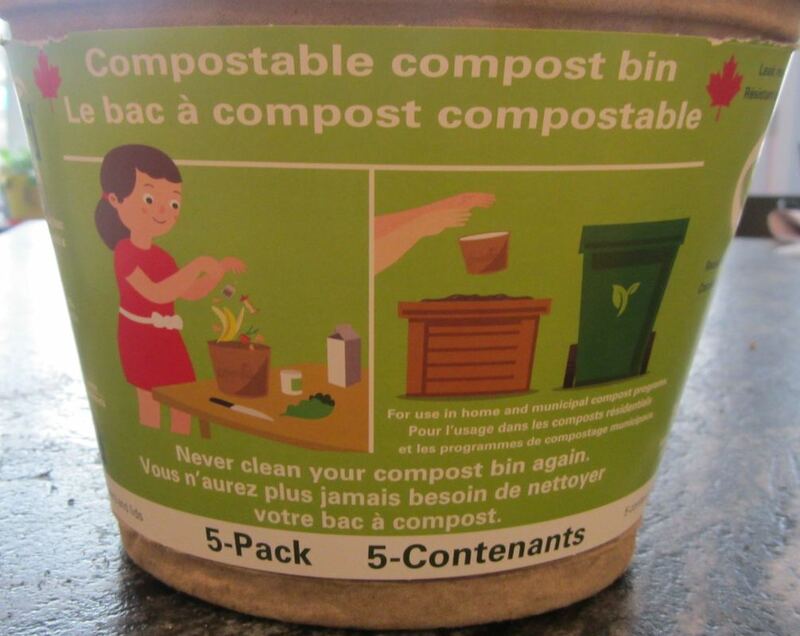 I purchased the compost bins at Home Hardware.